After the Pumpkin I had threw itself off the deck and committed "Pumpkin Suicide", I emailed the friend who grew it and brought it to me, telling him what had happened. He emailed me back and said that I would not be without a Pumpkin for the 31st. 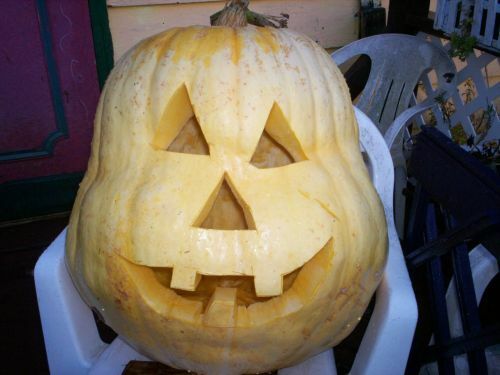 He and his wife dropped by yesterday and told me I would have the pumpkin in the afternoon. Well, shortly after they left it poured down with rain, so later in the afternoon, still raining, I phoned them to say that it was just too wet and miserable a day for him to be doing this. His wife said he was outside, soaking wet, taking the inside of the beastie out and they would be over with it shortly. He had already done a larger one but it was so big he couldn't get it in the car. Before long they arrived and lugged the creature up and onto the deck. Put it in one chair and it broke the chair, lol, had to get another chair and managed to get it in that but it wouldn't go all the way into the seat. Never the less, it stuck there. Now are they great friends or what!! Early this morning I was out carving a face in it. I am so pleased. Well, I couldn't connected to the internet most of the morning so needless to say I was getting a little frustrated. I figured I'd leave it for awhile so my mind went on to this large Pumpkin a friend grew and gave me. I wanted it on the front porch and had to get it up four steps. As it was so heavy I couldn't get it off the ground, someone suggested I cut the top off and take out the inside. Brilliant idea! So I go out with a very large knife and a scoop and start to work on it. This made it considerably lighter so still, nearly wrecking my back, I get it up on the deck. Thinking I would carve the face out later today, I put the top back on, went down the steps and looked back at it and decided I had found the perfect place for it. Came back inside and tried the computer again. Yay, it was working again. After a while, I got up and looked out the front door....Sob! !....there, back down on the ground is my pumpkin all in peices. I was shattered, not unlike the pumpkin. I don't know how it got knocked over but one of the cats was there looking up at me. Could it be that she pushed it over?? Something nice happened yesterday. 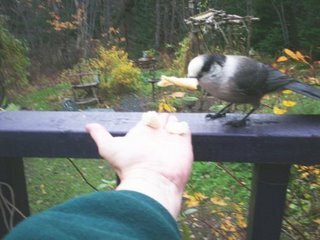 I saw a Grey Jay outside. Haven't seen one around for over a year I'd say. So, I got my camera and some bread and managed to get a picture. It was very awkward with the camera in one hand and holding the other hand out with the food for the Jay. I hope more start coming around as they are such sweet creatures. I don't seem to have much to write about here on a daily basis. My life seems rather boring compared to other bloggers. Up before daylight, put coffee on, feed cats, light fire in stove, let chickens out at daybreak, fill bird feeders, clean house, do things that need doing outside. Roger has been away for a week now, two more to go. My daughter came for a few days last Thursday and stayed until Monday past. As always it was wonderful to have her here. We didn't accomplish all the things we had planned. She spent a lot of time upgrading my computer. A friend, who grows these giant Pumpkins, brought me one on the weekend. I told him to bring the smallest one he had. As it was, he had to strap it onto his body with this carry thingy. I told him to put it down near the gate as I couldn't think where I wanted it at the time. Later, my daughter suggested I put it on the small front deck so that it could be seen from the road when lit. The next morning I went out and rolled it across the lawn and managed to get it to the bottom of the steps. Today, if it ever stops raining I will try to get it up the four steps to the deck. Don't think I will manage it though. I daresay I will have to call on "a Man" to do the job. It's been raining here for days. Everything is soaked outside, however, I can hear the stream rushing and when I walk over besides it I feel I am in another world. So quiet except for the sound of the water. I lean up against one of the big trees and close my eyes, it's magical. Drat, bears around and about! I got word early this morning that bears have been sighted all around here. We were thinking they weren't around this fall as we had not seen one and no signs of any. We have heard noises coming from the woods and it sounds like a larger creature is about, but then I've heard scratching and scraping and on checking it out it's only been fox sparrows scraping through the fallen leaves looking for bugs. Now fox sparrows I don't mind but bears make me nervous, although there has never been a bear attack here to my knowledge. Last spring, I was in the city, and my partner said he looked outside and there was the largest black bear he has ever seen, sitting in one of the flower beds munching on a plant. This was only about 20 feet from the deck. He goes out and starts yelling and blowing his whistle to try to drive the bear away, but this only gets the bear curious and he gets up and starts walking towards the deck. That put paid to that nonsense! Another time, I went out early in the morning to let the chickens out when I saw the door was off the chicken house. The hens were fine but all their food was eaten. One time I had left a line of clothes out overnight as it hadn't dried during the day, the next morning all of it was off the line and rolled up in large balls. Another time I was carrying a bucket of compost through one of the archways when I looked up and there was a young bear running towards me. Needless to say I got out of there quickly. Looked like he was having a bit of fun. I'm not going to go into all the stories I can tell, the thing is, my partner is soon going away for three weeks and I'm stuck here by myself with bears around. It can be rather nerve wracking to say the least. Looking over my shoulder any time I'm outside. So, at day break, I'll be in my pajamas, with a Spanish dueling knife in my hand, as if that's going to help, lol, nervously headed for the chicken house to let them out and hoping that I don't see, I'll say it, an amazingly beautiful creature in my path. Another lost trip to the City. I took the afternoon bus into the city last Thursday, my parents picked me up once I arrived, then went to their house for supper. My daughter met us there and after supper we went to her house. I went in specificially to help her clean and fix up the third floor of her house as she is hoping to get a boarder to help with expenses. I also had a list of things I wanted to get while in the city. Friday morning, I started in on the cleaning and by lunch time it was looking pretty darn good. We decided to go shopping for part of the afternoon. I managed to get a few things on the list so after about two hours we went back to her place. After having a bite to eat we went to an opening at one of the art galleries then on to the Crows Nest, a private club, where we met up with a friend for a drink and chat. It was all lovely until we arrived back at my daughters at about 8:30pm. She checked her phone messages and there was a frantic call telling me to phone home immediately. I phoned and my partner answered, I could barely understand what he was saying, then a friend whom he had called when he found he was in trouble took the phone. Her and her husband were there, the ambulance had just arrive, partners speach was all slurred, his right eye was swollen and painful, his right arm wasn't working right and he could barely walk. She said that her husband was going to follow the ambulance to the hospital, an hours drive away, and she would phone back as soon as she heard something. Her husband, bless him, stayed at the hospital until 2:30 in the morning. In the mean time my parents said they would take me back home and stay with me for a couple of days. I phoned the hospital when we arrived and they said everything was fine, blood work, EKG, and cat scan were all negative. He was released that same afternoon so my Dad and I went in and picked him up. Although a bit weak, otherwise in good spirits. However, around midnight that night, it came on him again, only this time not so bad. He sat up for awhile, then lay down in bed and went fast to sleep. Thankfully he has been fine ever since except for feeling a bit weak. When Monday came, we had a big argument. I said he should go to the local doctor and tell him what had happened on the weekend. No way could I get him to go. So, we still don't know what happened. It seems that everytime I go to the city for a few days something terrible happens to him, healthwise. My daughter is thinking it's maybe anxiety attacks brought on because I have left him for a few days. lol, hard to believe that. He now takes his blood pressure three times a day as he is very nervous over his health. Although he would never admit that. So.............what can one do, he's still planning to go on his trip to the US on the l7th of this month. In the mean time I'm worried that he is going to have another "attack" of what ever it was. I wish they knew what had happened so we could at least put a name to it and do something about it.